The remarkable Costs of War project at Brown has just released this map of US military deployments in pursuit of counterterrorism operations overseas in 2017-18. You can download the pdf here. 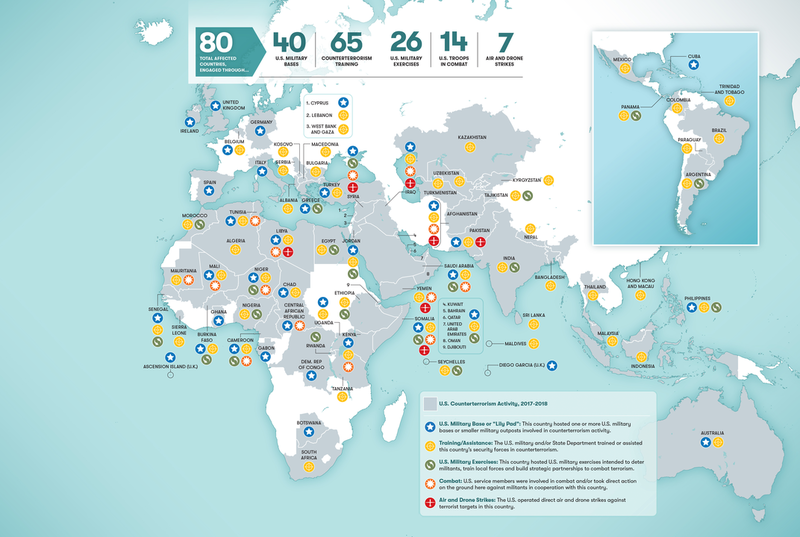 This map is the most comprehensive depiction in civilian circles of U.S. military and government antiterrorist actions overseas in the past two years. To develop it, my colleagues and I at Brown University’s Costs of War Project at the Watson Institute for International and Public Affairs, along with Smithsonian magazine, combed through U.S. and foreign government sources, published and unpublished reports, military websites and geographical databases; we contacted foreign embassies in the U.S. and the military’s United States Africa Command; and we conducted interviews with journalists, academics and others. We found that, contrary to what most Americans believe, the war on terror is not winding down—it has spread to more than 40 percent of the world’s countries. The war isn’t being waged by the military alone, which has spent $1.9 trillion fighting terrorism since 2001. The State Department has spent $127 billion in the last 17 years to train police, military and border patrol agents in many countries and to develop antiterrorism education programs, among other activities. 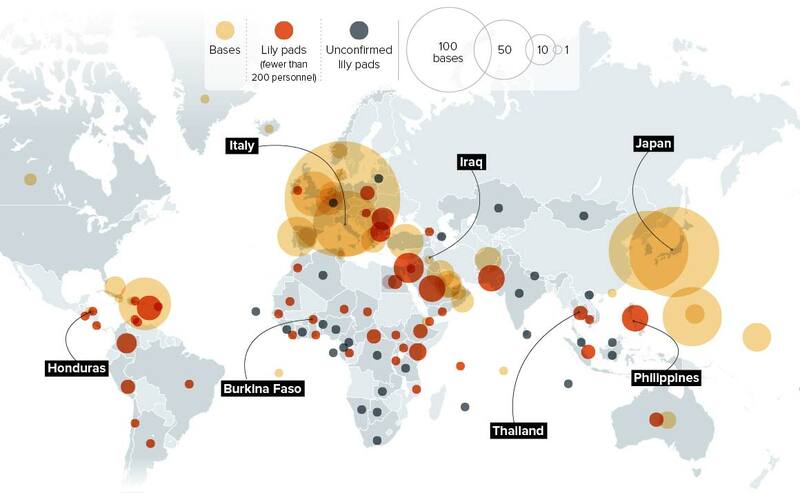 This map can usefully be compared with David Vine‘s heroic cartography of US military bases (from 2015) which I discuss in detail here. If you want more detail on US deployments in Africa, then the indefatigable Nick Turse has an excellent survey at the Intercept here. 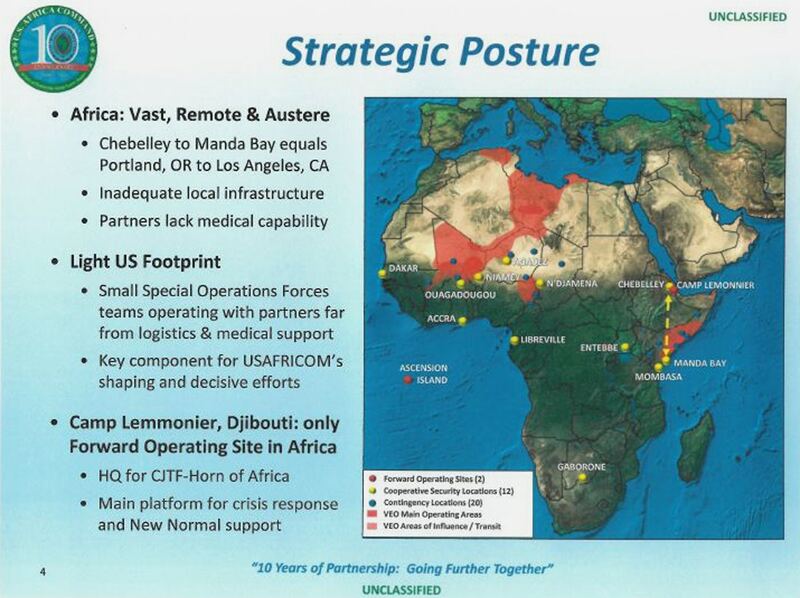 As Nick notes, the ‘light footprint’ claimed for US Africa Command (AFRICOM) in briefing documents (above) resolves into a vast network of bases across the continent. On which note, I also recommend Jolle Demmers and Lauren Gold, ‘An assemblage approach to liquid warfare: AFRICOM and the ‘hunt’ for Joseph Kony’, Security Dialogue 49 (5) (2018) 364-81. 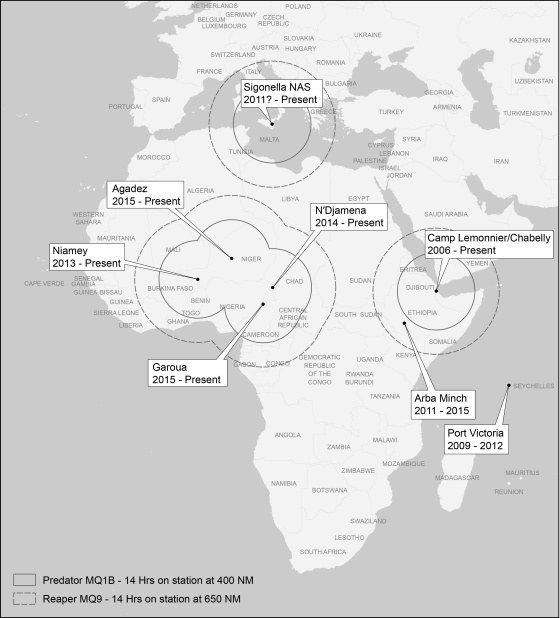 This entry was posted in Africa, counterterrorism, drones, late modern war, USA and tagged Adam Moore, AFRICOM, Costs of War project, David Vine, James Walker, Jolle Demmers, Lauren Gold, Nick Turse, Stephanie Savell, US military bases by Derek Gregory. Bookmark the permalink.